There’s a war going on today; a war for excellence in healthcare in the United States. JCI Marketing is passionate about not only keeping independent practices independent, but celebrates each time a client takes market share away from the health system that has been set up to compete against them. We have a TON of experience in nearly every field of medicine and every specialty of dentistry. JCI Marketing has had a very heavy hand in turning the revenues of practices around, turning red ink to black on the Income Statement. Just imagine, if we can make a physician of your specialty win in three cities in the US, we likely know how to make you win in your area. JCI owner Jared Cullop was also a partner in a very large Physician & Dental Practice Advisory Firm prior to starting JCI, and in the end, all of our services are Guaranteed Satisfaction. So, what do you have to lose? Not all of the core industries we serve need the same tools and projects in order to see great success. For example, most Medical or Dental practices wouldn't see a great return from a year-long Inbound Marketing campaign. Our experience has shown us that the three items below, when done well and together, bring the highest results for practices like yours. This becomes more and more vital as more emotions are involved in the decision to make a consumer decision. With Medical and Dental needs, emotions can run very high. Oddly, so many practices nationwide ignore this and only tell what service they offer or where they are located in their brand. The client, once seeing your logo or your website needs to have that, “I have found the right place” feeling immediately, regardless of what the text on your website says. More than 68% of all web surfing is now done on a mobile device. Having a true Responsive website for your medical or dental practice is vital. The term “Responsive” is the true answer to the mobile-web-age and is completely different than “Mobile Friendly” or “Mobile Compatible,” which are just Band-Aid terms that don’t help you at all. Your #1 face to your community is your website, and it simply must be truly Responsive. Heck, as of April 23rd, 2015, Google is dropping all sites from high rankings that aren’t Responsive. Just as it makes no sense to pay good money to send traffic to a bad, non-Responsive website, it makes TOTAL sense, once you have the website “hook” that will pull in all the fish you can catch, to spend the money to send all the fish to the hook, on the “bait” per se. These three things together - branding, responsive website design, and search engine optimization will most surely lead you to the top in your specialty and geographic region. 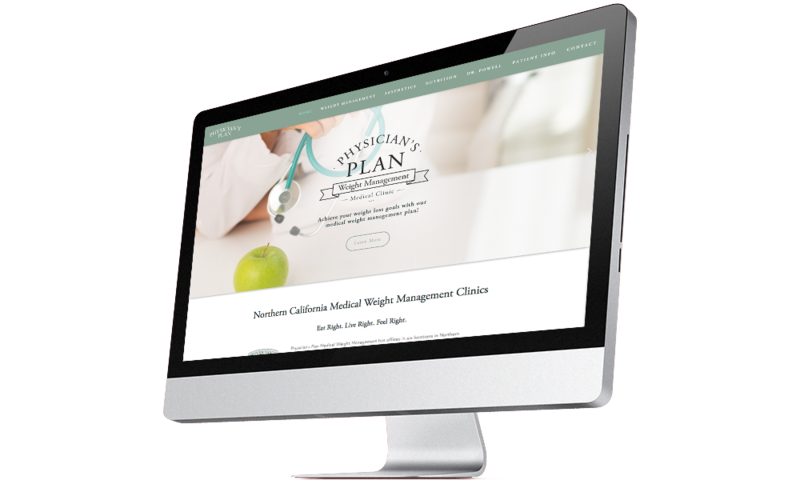 Physician's Plan Medical Weight Management has offices in six locations in Northern California: Redding, Chico, Yreka, Willows, Red Bluff, and Mount Shasta. Dr. Powell and his staff help patients lose weight and maintain weight successfully with the help of qualified medical practitioners. Their programs treat the whole person by combining the principles of nutrition, exercise physiology, pharmacotherapy (ethical medications), and behavior modification all in a caring and compassionate setting. Since nowadays it’s harder than ever to find a nutritious meal, let alone a snack, Dr. Powell also has a second website, CarbEssentials (link this too), that we built. You should check it out too. It syncs the inventory in 6 different locations, all with the online eCommerce store. 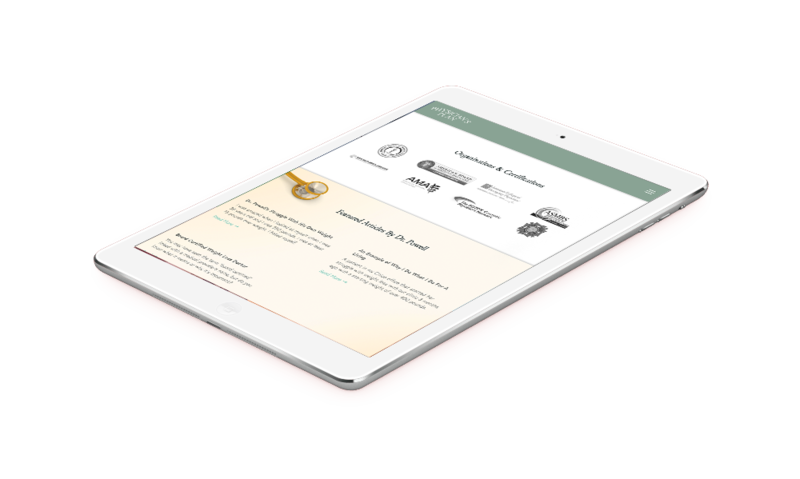 We helped outfit them with new iPads for helping in-store customers, even through the checkout process. Dr. Bob Ghelfi is a champion. The same kind of assertive action that had him move into advanced medicine such as Stem Cell Therapy caused him to come in to our office, hire us to fully brand his surgery center and build quite a high-end website before he even had a building for the center. The process was super smooth, and we are quite sure Dr. Ghelfi would give us a stellar reference. Now, his new office is cranking. This is a perfect example to show what we can do for a dentist or doctor that is already successful, doesn't need to spend a fortune in order to make a place for themselves in a market, but has the intentionality to create a new, respectable online presence. So many times people tell us "only X% (something crazy low) of our customers come from our website. We always try to explain that this is the typical "Catch 22". No leads because you've not invested in it. Verheul Family Dentistry is different, and we made sure they benefitted from that wisdom. You know you’re killing it in your industry when it’s 2016, you’ve never had a website, and your calendar is still full. This is Dr. Shoff. Rather than just having a list of clients, we wanted to help him get the right clients, help clarify some false rumors about what the best practice is, and help them make the transition as smooth as possible. He does things with excellence so when he was ready for a site, he was came to us and he’s glad he did. While every one of our clients has something remarkably special about them, SureTouch Breast Exam is somehow even more. See, these people found a way to scan a breast for cancer that doesn't involve radiation. Since it doesn't involve radiation, you don't have to be a radiologist to use it (and it's not super bad for you). This means that a group of women, or a city, can invest in one, have a "scan party" checking themselves, and be done with it. Super cool. The future is here.